Many Americans have a hard time distinguishing between the terms Arab, Middle Eastern, and Muslim. Here we break down the various terms to help you distinguish between these three categories. There are 26 countries or territories in western Asia and Africa where Arabic is the official or one of the official languages of the state: Algeria, Bahrain, Chad (with French), Comoros (with French and Shikomor), Djibouti (with French), Egypt, Eritrea (with Tigrignan), Iraq (with Kurdish), Israel (with Hebrew), Jordan, Kuwait, Lebanon, Libya, Mauritania, Morocco, Oman, Palestine, Qatar, Saudi Arabia, Somalia (with Somali), Syria, Sudan, Tunisia, United Arab Emirates, Western Sahara, and Yemen. Alternately, Arab typically applies to the 22 member states of the League of Arab States; these members include the above with exception of Chad, Eritrea, Israel, and the Western Sahara. In each of these countries there may be different ethnic groups whose mother tongue is not Arabic. Members of these groups may also speak Arabic, but they might not identify themselves as Arabs. For example, in both Chad and Iraq, members of non-Arab ethnic groups use Arabic as a lingua franca to communicate. Also, in many Arab countries, before the founding of the state of Israel, there were active Arabic-speaking Jewish communities in such places as Morocco and Iraq; most of these populations moved to Israel after its founding in 1948 but maintain aspects of their Arab ancestry. There are also minorities of Arabs in many other countries, such as Iran, Turkey, France, and the United States. To answer “Who is Middle Eastern?” we must ask ourselves “What is the Middle East?” The Middle East itself is not a fixed term. It was originally coined in the early twentieth century to designate the area between the British colony of India and the Near East (the Balkans and western part of the Ottoman Empire). Of course, the term itself incorporates a European perspective, since the Middle East is only “east” relative to western Europe; had the Chinese had the power to impose their perspective in our maps, the region might have been known as the Midwest! The “Middle East” is a term describing a region, or a geographical area sharing certain characteristics as opposed to areas like West Asia or North Africa, which define a relatively clear geographical location by reference to broadly accepted continental borders. This certainly complicates deciding who could be classified as “Middle Eastern”. Depending on how we define those characteristics, the borders of the Middle East can change. For example, we might describe the Middle East geographically as a hot and arid region in western Asia between the Mediterranean in the west and the Indian subcontinent in the east; or we might describe it historically as a predominantly Muslim area sharing a common cultural heritage based on Arabic; or we might describe it strategically from a geopolitical and economic perspective, with consideration for its large reserves of oil. Each definition has problems and might lead to a different map of the “Middle East.” For example, Turkey, Israel and Iran are not Arabic-speaking countries, yet most maps would include them in the Middle East. 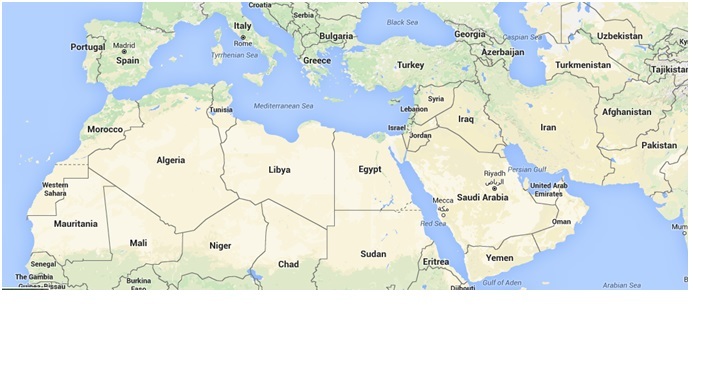 The Arabic-speaking countries of North Africa, including Egypt, Libya, Tunisia, Algeria and Morocco, are not in Asia. Most current maps leave them out of the Middle East, except for Egypt, despite a long shared history and many cultural similarities with other Arab countries. Yet the same maps often include Iran, Afghanistan and sometimes even Pakistan – countries with different languages, some shared history and some very different cultural and historical bases. There is no real correct answer to the question, “What is the Middle East?” There are different definitions, which often overlap and often change according to shifting perspectives. One interesting note is that the concept of the Middle East has been adopted in most of the languages of the region themselves: in Arabic, the region is referred to as al-sharq al-awsat, in Turkish as orta dogu, in Persian as khavarmiyaheh and in Hebrew as mizrach tichon. So, although the concept is relatively new, came from the outside, and is imprecise, it’s used throughout the region! By most estimates, about one-fifth of humanity’s six billion plus people, or approximately 1.6 billion, is Muslim. While we tend to think of Muslims as being in the Middle East, perhaps because that is where Islam began, most Muslims don’t live there. In fact, the country with the most Muslims is Indonesia in Southeast Asia (202.9 million Muslims), and the largest regional concentration of Muslims is in the South Asian countries of India, Pakistan and Bangladesh, with nearly half a billion Muslims. Africa also has a very large Muslim population-not only are there over 180 million Muslims in North Africa, but also approximately 220 million Muslims in the countries of sub-Saharan Africa as well. There are also minority Muslim communities in countries across the world, from China to Western Europe to Canada and the United States. Think about the cultural diversity of these Muslims all over the world, from Indonesia to Senegal, from Boston to Bangladesh, from Syria to Germany. The definition of Muslim varies depending on which criteria you use. Most textbooks give a definition based on practice of the “five pillars” of Islam, so that Muslims are those who give the profession of faith, pray five times a day, fast during Ramadan, give charity to the needy, and make the pilgrimage to Mecca at least once during their lifetimes. On the other hand, all Muslims, like members of all human religions, are not equally devout and don’t practice Islam exactly the same way, so you might consider Islam to also be a cultural identity and heritage as well as a religious belief. Some cast the net very widely, and argue that a Muslim is anyone who believes in one of the monotheistic religions, including Jews and Christians, since “Muslim” literally means one who submits to the will of God. On the opposite end of the spectrum, there are exclusionist definitions of Islam with very specific doctrinal and political belief criteria by the standards of a particular group. Outcomes: Students will be able to discuss the characteristics of a geographical region, and to list characteristics of the Middle East that define it as a region. Students will be able to give a list of countries in the Middle East and explain their choices and omissions. Students will be able to analyze maps as constructed documents and make educated assumptions about the point of view of makers of Middle East maps. What is the Middle East? What countries does it include? How do you decide what countries “belong” in the region, and what countries do not? Break the class into groups of 3-4 students. Have each group list the requirements for countries to be included in the Middle East, and then create a country list of states that “fit” that definition. What is a region, and in what way does the Middle East fit that definition? What are the defining characteristics of the Middle East? When you listed the countries that fit your definition, how many countries did you include? Compare your group’s list to those of other groups. Are they the same? What countries did you include that others didn’t, and vice versa? Where is the map centered? How far do its borders reach? Is this significant? Why or why not? Now have the entire class review the exercise. Are there countries everyone agreed belonged in the Middle East? Why do you think these countries were a more “natural” fit to everyone? What countries did groups differ on? Why do you think people had different opinions about including them in the Middle East? Now review the set of maps below. Note what countries are included in each map of the Middle East, and which countries are omitted. How have the mapmakers defined the Middle East, and what criteria do you think they used to draw the borders of the region? Do you agree with their choices? Why or why not?